How to set up a React Native project in Bitrise. How to run Jest and Detox tests. How to configure the build workflow. To follow this tutorial, you need to have basic knowledge of React and React Native. The project that we will be working on uses Redux, Redux Saga, and Detox, so experience in using those will be helpful as well. Reading the first and second part of this series is optional if you already have previous knowledge of how continuous integration is done in React Native. If you want to have a brief overview of the app that we’re working on, be sure to check out part one of this series. To make sure the new project will be as clean as possible, we will be initializing a new React Native project and push it on a repo separate to the one we used on part two. Go ahead and create a new repo named ReactNativeCI_Bitrise on GitHub. We’re switching to the part2 branch so we can get the final output from the second part of this series. After that, copy the src folder, App.js, and package.json file from the repo you cloned earlier to the project you just created. Only proceed to the next section if you managed to run the app locally. Because if it wouldn’t work locally then it’s not going to work on the CI server either. Click on the Add first app button to add your app. First, select your GitHub account and the ReactNativeCI repository you forked earlier. After that, you have to specify the repository access. This is the method used by Bitrise to get access to the repo you forked earlier. 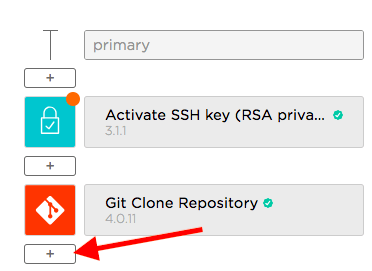 Since you’ve already connected your GitHub account to Bitrise, Bitrise is able to add the SSH key used for accessing your repo to your GitHub account. So click on the No, auto-add SSH key button. You will then see it added on your GitHub’s account security page. Next, it will ask you to enter the name of the branch. Put master on the text field. If it’s taking too long, you can click on the Expand Logs link to see what Bitrise is doing behind the scenes. From the above configuration, you can see that Bitrise has configurations for both Android and iOS. Note that this doesn’t mean that we will only have to maintain a single Bitrise app instance. Just like in App Center, we’ll still be creating two app instances, one for each platform. This is to separate the code integration (and eventually the release and deployment) of changes made to the app. Due to how young React Native is as a platform, there will be times when there are unexpected bugs that only occurs only on Android or iOS. This causes a delay in the time in which new features will be tested, integrated, and delivered to users. This separation makes it easy to only release on Android or iOS, but not both. The final step is to register a webhook. 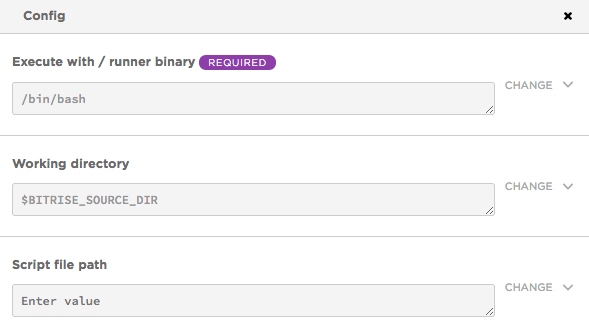 This allows Bitrise to automatically build the project every time a change is made to the branch you selected earlier. Again, you will see this webhook is registered in your GitHub account’s security page. Once that’s done, Bitrise will build the app for the first time. 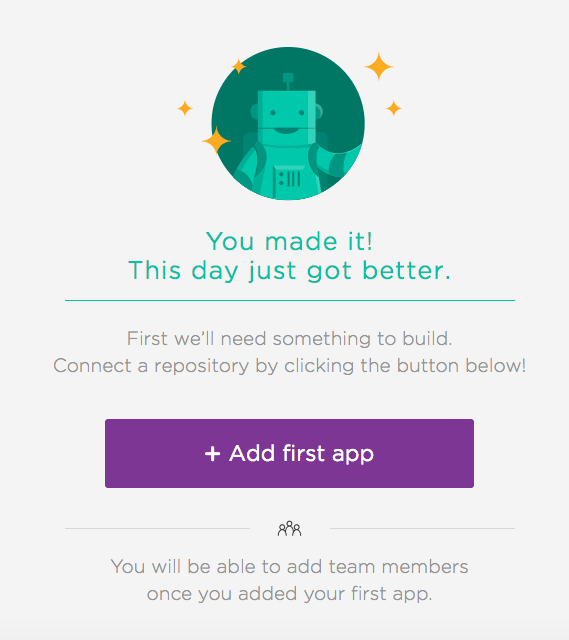 We don’t really want to build the app yet because it will fail, so click on the Builds tab and abort the current build. We’ll proceed to manually initiating a build once we’re sure that it will succeed. Note that when you sign up for a Bitrise account, you’re automatically signed up to the Developer plan. This gives you an unlimited number of builds per month, and each build can take up to 45 minutes. So don’t worry about meeting the maximum builds per month until you come out of their 14-day trial. Before creating the other app instance for the other platform, first, rename the one you just created to ReactNativeCI-Android. You can do that by going to the Settings tab and updating the Title field. We need to do this so we won’t get confused because Bitrise uses the name of the GitHub repo by default. Once that’s done, go through the same steps that you just followed to create a new app. Don’t forget to rename the new instance to ReactNativeCI-iOS. Just like in part two, we’ll be making a few changes in this part as well. This time, we will add the functionality for saving the favorited Pokemon to local storage. This way, they will still be marked as a favorite even after the user restarts the app. The Git workflow we’ll be using is still the same as the one we used on part two. I explained the workflow in part one, so if you haven’t read that, you can do so by going to the CI workflow in React Native section in part one of this series. git commit -m "add local storage functionality"
At this point, do some manual testing by marking a few Pokemon as a favorite then relaunch the app. If the ones you selected is still selected when the app is relaunched, it means that the new feature is working. We’re not going to push the changes yet because we still have to add some end-to-end testing code with Detox. In this section, we’ll be setting up end-to-end testing for the app using Detox. Start by following the Install Dependencies section on Detox’s Getting Started documentation. If you’re following this tutorial wanting to apply it on your own projects, and you are using packages which uses a lower version of Gradle, you can actually fork the GitHub repo of those packages and update them to use Gradle 3. Once you’re done updating the files, execute react-native run-android on your terminal to check if everything is still running correctly. Don’t forget to launch a Genymotion emulator or Android emulator instance before doing so. For iOS, you don’t really need to do any additional configuration. Just make sure that you have the latest version of Xcode installed (or at least one of the more recent ones). This way, you can avoid having to deal with issues that only occurs when running older versions of Xcode. The only things you need to change in the configuration above is the type and name under the ios.sim.debug and android.emu.debug. If you’re using Genymotion like I am, you can keep the android.emu.debug config in there. Just be sure to replace 192.168.57.101:5555 with the actual IP address that’s listed when you execute adb devices while the Genymotion emulator is open. This will create an e2e folder in your project’s root directory. This folder contains the config and test files for running the tests. 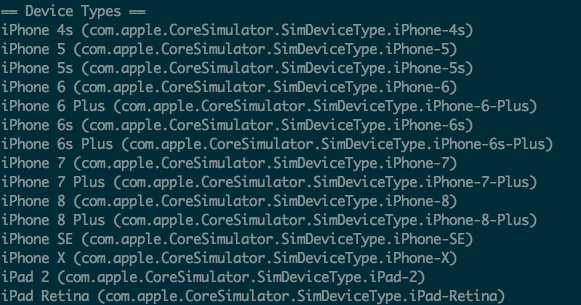 git commit -m "add detox tests"
The above method works for iOS, but I never got it to work on Genymotion. So it’s better to opt for the --reuse option. 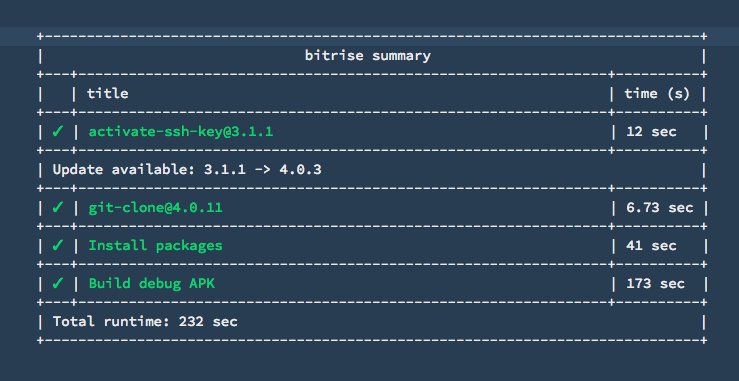 Now we’re ready to configure Bitrise to build the project and run the same tests that we’ve set up for the app. First, go to your app dashboard and select ReactNativeCI-iOS then go to the Settings tab. From there, update the Default branch to develop and save the changes. The Stack is the type of machine where each of your workflows will be executed. In this case, we’re selecting Xcode 9.4 because it’s the latest stable version that’s currently available for iOS development. More importantly, it’s the same version of Xcode that I have on my local machine. To ensure that your builds will be as smooth flowing as possible, always select a similar stack to your local machine. If that’s not possible, then select the one that’s only a version lower or higher than what you have. After the Git Clone Repository step, create a new one called “Install detox dependencies”. As you can see, Bitrise has a bunch of pre-written steps. All you have to do is look for them and add it to your own workflow. But for things that don’t have a pre-written script, there are also steps that allow you to add them. One of those is the Script step which allows you to supply your own script. From the script above, you can see that these are the same commands you can find on Detox’s Getting Started guide to install Detox, so be sure to update these with the ones you find on that page in case it changes in the future. From the config above, the Working directory is $BITRISE_SOURCE_DIR. By default, this points out to the root directory of your React Native project. Note that you can’t find $BITRISE_SOURCE_DIR anywhere in the Env Vars tab. This is because it’s one that’s set by Bitrise by default so it always points out to the same thing. It’s a good practice to make each individual step only do one thing even though you can bring all the commands into a single script. Aside from keeping things lightweight and allowing you to easily debug your scripts, this also allows you to easily rearrange your steps (via drag and drop) and delete the ones you don’t need. 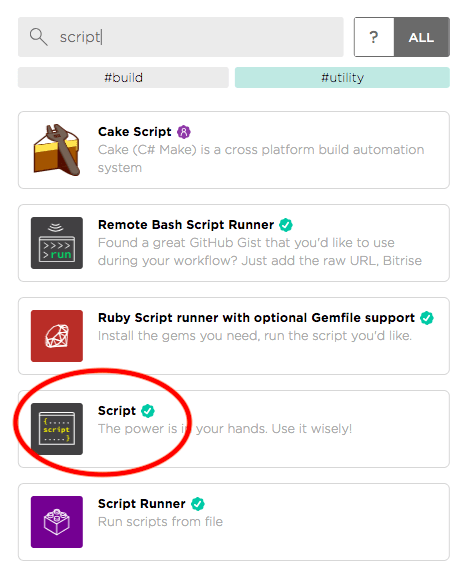 If you’ve skipped to this section because you only want to build for Android, you should scan through the section above on configuring the build workflow for iOS because this section assumes you already know to configure the build workflow on Bitrise. If you haven’t done so already, go to the settings tab of the ReactNativeCI-Android app and set its default branch to develop. 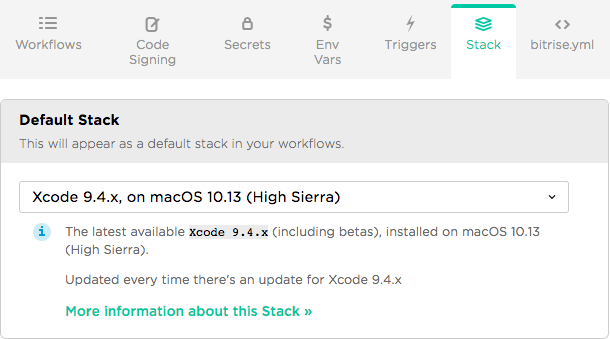 Next, click on the Workflow tab and click on the Stack tab. This time, select Android & Docker, on Ubuntu 16.04 - LTS Stack as the default stack. 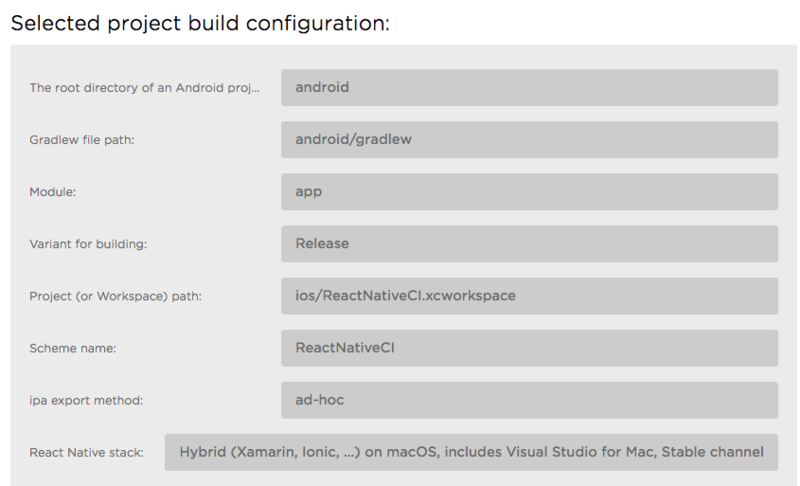 This should give you the best environment for building an Android app with React Native. Don’t forget to save the changes once you’re done. When you’re using the workflow editor, Bitrise actually updates the bitrise.yml to match what you have on your workflow. This makes it really easy for developers to transfer a workflow that they have on an older app over to a newer app. Note that you can actually have different workflows for different build processes. In this tutorial, we’ve only configured the “primary” workflow which is the default build process that what we want to do everytime some changes is pushed into the repo. But you can also have a “deploy” workflow or a “testing” workflow, and the steps for that can be different from the one you have in your primary workflow. 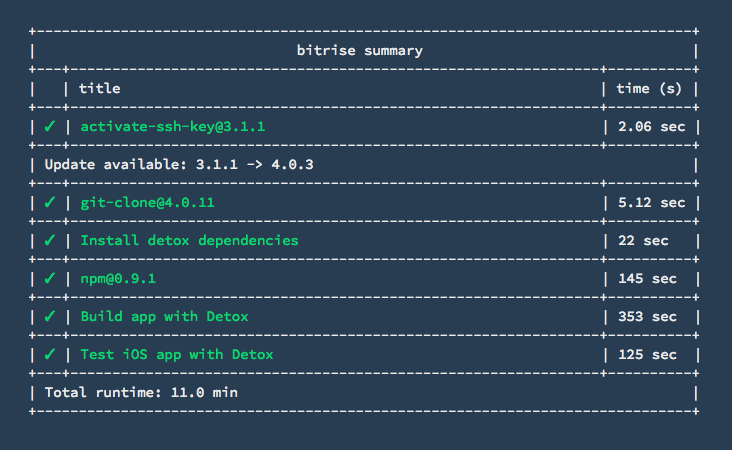 Another good thing about Bitrise is that you can run your builds using the Bitrise CLI. 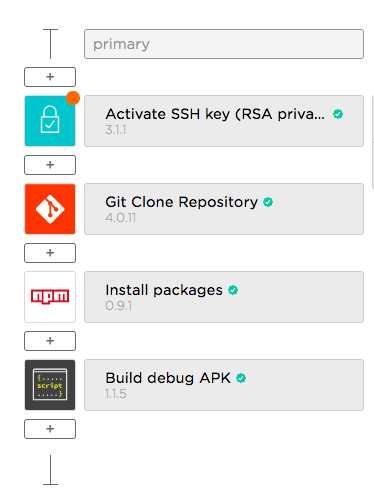 This is Bitrise’s open-source task runner for running your builds locally. You can follow the instructions on that page to setup Bitrise CLI. 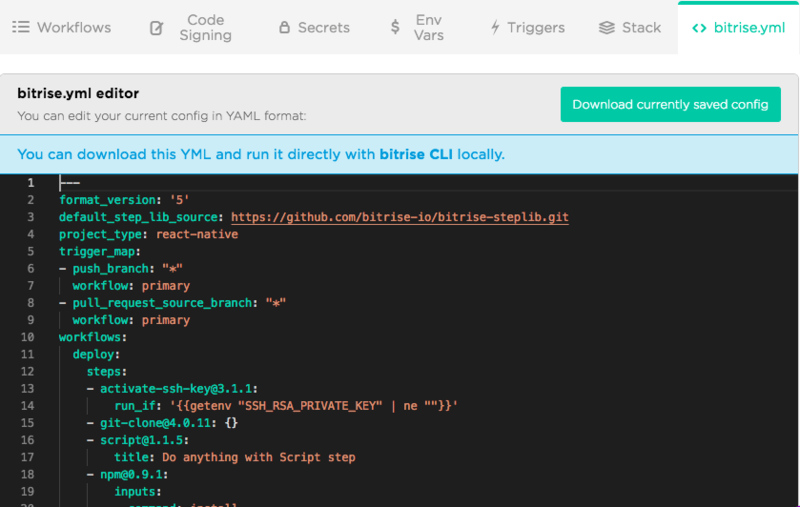 Once you’ve setup Bitrise CLI, you can simply download your project’s bitrise.yml file and copy it over to your React Native project’s root directory. If you find that the Bitrise CLI doesn’t meet your requirements, or you get errors that you don’t get while running the build on Bitrise, you can also make use the Bitrise Docker image. This allows you to run your builds locally using the same environment as the one used by Bitrise’s virtual machines. That’s it! 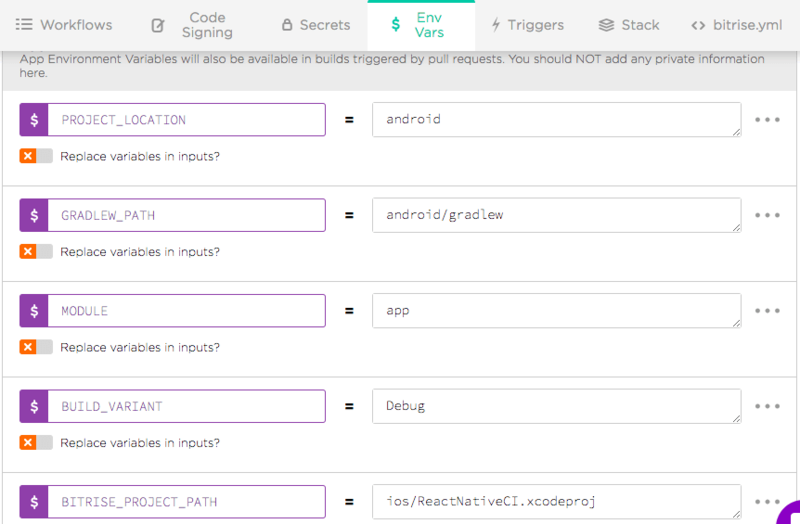 In this tutorial, you learned how to use Bitrise for a solid mobile continuous integration setup. Specifically, you learned how to set up a custom build workflow that runs Jest snapshot tests, Detox end-to-end test, and then build the app. That also wraps up this series so I hope you’ve gained the necessary skills in setting up continuous integration for your React Native app. You can find the code used in this series on its GitHub repo. The master branch contains the final output for this entire series.